A forest fire, a merry-go-round, a spinning top, a kaleidoscope, a domino effect, an avalanche, or a one-thousand piece puzzle assembled every day: pick one of these metaphors or choose one of your own. Any one of them reliably represents the frantic pace at which global events are occurring, particularly in the Middle East. It is nothing short of astonishing. I think the most applicable analogy of all would be childbirth pains. That is the picture used by Jesus to depict the exponential escalation of natural disasters, epidemic diseases, wars, ethnic conflicts, surge and resurge of Anti-Semitism, rampant immorality, distortion of and deviation from the absolute truth of God’s Word (Bible), and the international geopolitical maneuverings that are part and parcel of the rumors of war the world over—just before the Rapture and the ensuing Great Tribulation. “But all this is only the first of the birth pains, with more to come” (Matthew 24:8). It is ominously obvious that we are experiencing the final global contractions before the unbearably painful, but divinely devised, delivery from self-destruction. Employing another analogy: things are taking place at the speed of light. In this case referring to the light of the sun as it rises each day; hardly a day goes by without a new development or a spin-off of an earlier event. “Now learn a lesson from the fig tree. When its branches bud and its leaves begin to sprout, you know that summer is near. In the same way, when you see all these things, you can know his return is very near, right at the door. I tell you the truth, this generation will not pass from the scene until all these things take place” (Matthew 24:32-34). Folks, we are that generation. The 21st century fig tree has sprouted into full bloom. Messiah’s return is very near. Many Eye of Prophecy articles are dedicated to that reality. See for example, The End of the Age … How Close Are We? Posted 11-23-13; The Omega Generation (2-15-14); The Seven-Year Treaty (5-2-15). Also, Look Up, Redemption is Near, Part I & II, published 7-11 & 7-18-15. Watershed waves of uncertainty have breached our sense of security like never before. One menacing world incident after another has compromised our hope for a brighter, better future. The threat of economic collapse or terrorism striking our country, our city, our neighborhood, our home has created an air of apprehension and even dread, because there’s little we can do to prevent these kind of things from happening. 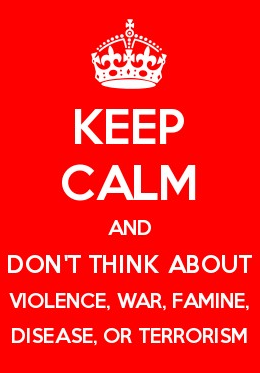 Above all, there is acute anxiety over another world war. Our world is smaller now than when World War II engulfed the planet with death and destruction. The smaller our world, the more likely that local and regional conflicts will become global. Who among us doesn’t fear and hate war? Or should I say those of us who truly love and long for peace, as there are some who are blood-thirsty and power-hungry; who embrace violence to achieve their warped objectives and continue vicious oppression even after their conquests. Is there really any glory in war? Perhaps to the victors? Perhaps for a while? But what about the dead, civilians and soldiers alike? The horribly wounded … those who have missing limbs or scarred bodies for life? The dispossessed and displaced refugees? Why must so many woman and children suffer so much? How else can we explain approximately 72 million people killed in World War II, except to say it was hell on earth. Unimaginably, WW II will pale in comparison to the catastrophic carnage of the Great Tribulation, in which well over half of the world’s population will perish. Actually closer to five of every six people will not make it through those seven years. (Please see Eye of Prophecy article, Shocking Statistics of the Great Tribulation, posted 6-6-15. I didn’t realize the significance of the posting date of that article until later … it was the anniversary of D-Day). We’re getting a terrible taste of mass casualties of war again … the quarter million who have died in Syria. Which, appallingly, will be the proverbial, “drop in the bucket” (a very large bucket) compared to the loss of life when the most astounding “peace treaty” of all time takes place shortly after the Rapture of believers to heaven. 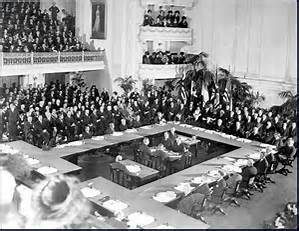 War is so horrendous that we not only make treaties to end wars, such as the Versailles Treaty of June 28, 1919 that brought an official end to the Great War—the war that was supposed to end all wars—but we also arrange treaties to (hopefully) prevent nations from warring against each other. They are peace pacts before the fact. Whether these agreements are full-fledged treaties or limited to “non-aggression pacts,” the idea is for a nation or a coalition of nations to agree to disagree on political, economic, and cultural differences. But not to resolve these differences through war. Thus, we have NATO, the EU, the UN, and individual treaties between two nations; all with the noble, yet often unrealistic, objective of creating then maintaining peace between peoples on this planet. The futility of these preventive peace agreements is found in their historical irony. This travesty comes in two fragile forms: (1) the truly peace-loving side appeasing a dictator or state dictatorship through a non-aggression pact or peace treaty. (2) Peace driven nation or nations conducting a justified military campaign with “limited” objectives, such as mere containment of the enemy. There is no real resolve or commitment of forces necessary to decisively “win” the war. Regarding appeasement, there are several examples throughout history. Sticking to the more recent 20th century, there are two that stand out. Even if you only got a “D” in history, you probably remember that British Prime Minister Neville Chamberlain proudly pronounced these words after he negotiated a “peace treaty” with Adolph Hitler, called the Munich Agreement … September 30, 1938. It is undoubtedly the most egregious example of appeasement in the annals of diplomacy. What was supposed to be one of the greatest peace agreements ever, permitted Germany to annex part of Czechoslovakia and part of Austria (Sudetenland) in exchange for Hitler’s promise of non-aggression anywhere else in Europe. How long did it last? Until March, 1939, when Hitler unilaterally annexed the rest of Czechoslovakia. Then on September 1, 1939 the Third Reich began its blitzkrieg conquest of Poland, followed soon by a lightning quick defeat of France. Thereafter (1940) England was smack in the middle of their bloodiest war in history. One that erupted into a World War, which dwarfed The Great War (World War I) that was to end all wars. Prime Minister Chamberlain also used the phrase, “peace with honor,” to describe the Munich Agreement. With his impression of an ostrich (head in the sand), Chamberlain naively and blindly believed Hitler would honor the agreement. God Save the Queen! Because one-way, lop-sided peace agreements (appeasement) certainly won’t! The second example of appeasement was the Nazi-Soviet non-aggression pact that the Third Reich duped Russia into signing in August, 1939 just before Germany invaded Poland. Hitler had no intention of honoring that agreement; in June, 1941 Germany launched Operation Barbarossa against Russia. Battles fought by these two countries produced, by far, the most casualties of World War II. As an example of lack of all-out commitment to decisively defeat an enemy that crosses national and racial (red) lines, we need look no further than Korea and Vietnam. All kinds of concessions were made by our Presidential Staff, by our Congress, and even by some of our military leaders. It was pacification borne mostly from fear of drawing Communist Soviet Union and/or Communist China into these wars. There were also others to appease, such as the liberal left within our country. But the disastrous results were the same: a tenuous truce with North Korea that is still a communist country and still poses a (nuclear) threat to South Korea, the United States, as well as other nations. And a truce that was more of a surrender to North Vietnam which also remains communistic, under the oxymoronic name of the Socialist Republic of Vietnam. The definitions and concept of socialism and republic are absolutely incompatible. That’s not all. How many fewer American and coalition casualties would there have been, if Operation Desert Storm in the Gulf War of 1991 had been allowed to continue north in Iraq, right up to the front door of Saddam Hussein’s palace? Instead, we had to go back again in 2003, suffering even more casualties. Even then, we adopted a containment policy. And it only got worse. In just a few short years after President Obama pulled our ground forces out of Iraq, ISIS filled the gap. Then there’s the Iran Nuclear Agreement completed just last year. Where do you suppose that will lead? Is there any indication, whatsoever, that Iran’s supreme potentate, Ayatollah Khomeini, is or will be any different than Adolph Hitler? Among many other sordid similarities, they both uttered their diabolic diatribe that not a single Jew remain on planet Earth. Ever so tragically, Hitler almost succeeded (Holocaust). 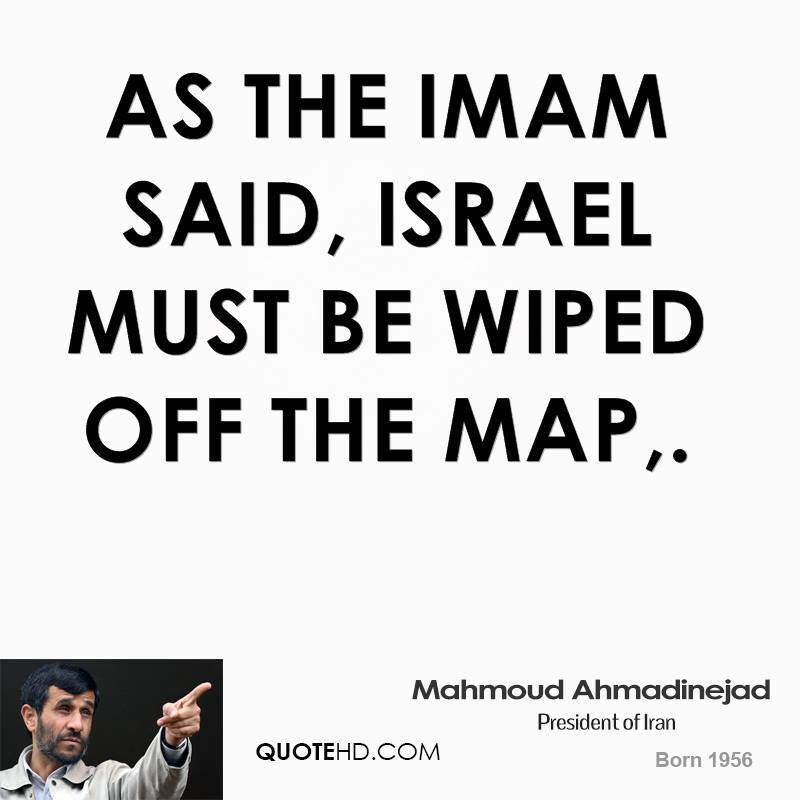 Iran will pick up where Hitler left off when it joins the Gog/Magog attack on Israel. With a few exceptions, Eye of Prophecy articles do not get all that “political.” Even when they do, the topic is in the larger context of Biblical principles and prophecies. In the context of today’s post, the point needs to be made that peace treaties, especially those designed to be preemptive, are seldom (as is said) worth the paper on which they are written. There is a reason for that: Invariably, one side is not honest … they have ulterior motives. The only thing a non-aggression type peace treaty does is to give the sinister side more time to accomplish their amoral agenda. There are two striking examples in the Bible, one past and one future. The past precedent involves much of Israel’s chronicles from the time that Joshua led them into the Promised Land to the time that Nebuchadnezzar crushed Israel, demolished Jerusalem and Solomon’s Temple, and exiled the surviving Jews to Babylon. We’ll focus only on the early stages of Israel’s history … their conquest of Canaan, as commanded by God himself. For two reasons: (1) God promised this land to Abraham, Isaac, Jacob, and their descendants. (2) The majority of the Canaanite nations were exceedingly evil people, engaged in detestable practices such as sacrificing their children to pagan, man-made gods. God gave his people specific instructions as to which societies to destroy and which ones to show mercy, to the extent of allowing some gentile nations to exist alongside of the Jews in the Promised Land of Israel. Instead, the Israelites permitted a few of these wicked tribes to exist and their evil conduct to continue. The “peace treaties” that Israel made with them came back to bite all twelve tribes for centuries … through constant attack by and war with some of these pagan nations. Even worse, Israel began to worship pagan gods. It was the first classic example of ill-advised and God forbidden peace pacts that led directly to war. War and Peace. Incompatible. Right? Of course, right. Which also means that a treaty of peace should never be an intentional or even unintentional guarantee that war will inevitably follow. Correct? No, not even close. “The ruler will make a treaty with the people for a period of one set of seven (seven years), but after half this time, he will put an end to the sacrifices and offerings. And as a climax to all his terrible deeds, he will set up a sacrilegious object that causes desecration, until the fate decreed for this defiler is finally poured out on him” (Daniel 9:27). In several Eye of Prophecy articles, I have written much about this treaty and the one (Antichrist Nero) who persuades Israel and Muslim nations to accept this settlement. In order for both the Jews and Arabs to agree to such a treaty, substantial concessions will be made by both sides, most of which will be tantamount to appeasement of the Arabs. Israel will agree to most anything just to regain full functional control of Temple Mount, and rebuild their Temple on their most holy site in the holy city, Jerusalem. Likewise, some Eye of Prophecy articles have been wholly or partially dedicated to the Gog/Magog war against Israel, but in today’s article we’ll make a connection that perhaps even many students of the Bible haven’t seen. What we’re going to see is that a devastatingly deceptive “peace” treaty is what will prompt the Gog/Magog coalition to march against Israel, which will take place in the first year or so of the Tribulation. It will be, “Peace for our time” all over again. Let’s revisit one of the most well-known prophetic passages in Scripture. “This is another message that came to me from the Lord: ‘Son of man, turn and face Gog of the land of Magog, the prince who rules over the nations of Meshech and Tubal, and prophesy against him. Give him this message from the Sovereign Lord: Gog, I am your enemy! I will turn you around and put hooks in your jaws to lead you out with your whole army…” (Ezekiel 38:1-4). *Note: The hooks in Gog’s jaw will be this seven-year peace treaty and the ensuing sense of security (complacency) it will bring to Israel. The Lord then gives Ezekiel the identity of some of the nations that will join forces with Gog. The nations today that are the most prominent in this satanic confederation are Russia, Iran, and Turkey. There are also several other countries. Through Ezekiel, the Lord says to Gog: “Get ready; be prepared! Keep all the armies around you mobilized, and take command of them. A long time from now you will be called into action. In the distant future you will swoop down on the land of Israel, which will be enjoying peace after recovering from war and after its people have returned from many lands to the mountains of Israel. You and all your allies—a vast and awesome army—will roll down on them like a storm and cover the land like a cloud” (Ezekiel 38:7-9, italics for emphasis). Why can we know that? Because, the Jews (in great numbers), “have returned from many lands” to the Promised Land, especially after Israel was reborn as a sovereign state in 1948. This miraculous rebirth took place just three years after six million Jews had been slaughtered in the Holocaust. The phenomenon of Israel being “born in a single day” (Isaiah 66:8) signaled the greatest “recovery from war” that any nation on earth has ever experienced. Four subsequent wars would conclusively confirm the prophecy that the Gog/Magog alliance would attack Israel when she, will be enjoying peace after recovering from war. They were Israel’s 1948 War of Independence, 1956 Suez War, 1967 Six-Day War, and the 1973 Yom Kippur War. In just the last few months and weeks, Russia, Iran, and Turkey have “mobilized their armies” and have taken “command of them” in Syria, which borders Israel. Although the mobilization is limited, the fact remains that for the first time in history these three Magog nations are conducting military operations in the Middle East. Unmistakably, this is the beginning fulfillment of Ezekiel’s astounding prophecy. 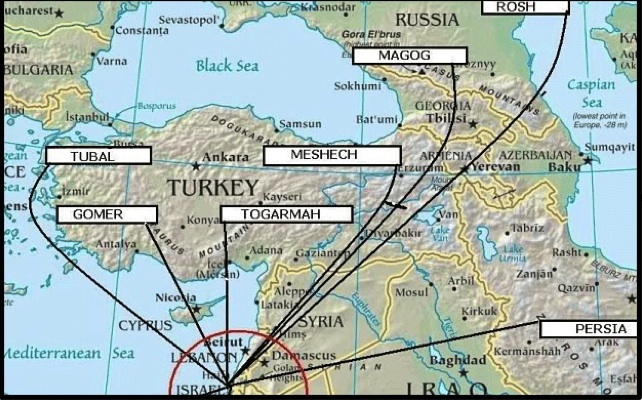 It’s just a matter of (a short) time before the full military might of Russia, Iran, Turkey, and other nations descend on Israel to completely bring about the Gog/Magog prophecy. As a refresher from previous Eye of Prophecy articles on this subject, two of the reasons are: (1) if such an attack were to occur before the Rapture, then the United States and our Western allies would definitely come to Israel’s rescue. However, the (soon to come) Rapture will leave the United States (and to a lesser extent its coalition countries) much weaker, if for no other reason than the number of believers taken. (2) God’s direct intervention against Gog/Magog includes supernatural plagues that are akin to the sixth seal and first trumpet of Revelation 6:12-14 and Revelation 8:7, respectively. Obviously, all of the Revelation judgments take place during the Great Tribulation. There is a third reason—the focus of today’s article—why the Gog/Magog prophecy won’t take place before the Rapture: the prerequisite condition that Israel “will be enjoying peace when the attack begins. We’ve already looked at the first reference to that “peace” in the above quoted verses. For emphasis, the Lord makes two more references … one implicit, the other direct. “…At that time evil thoughts will come to your mind, and you will devise a wicked scheme. You will say, ‘Israel is an unprotected land filled with unwalled villages! I will march against her and destroy these people who live in such confidence!” (Ezekiel 38:10-11). Although Israel is, and will be when Gog attacks, a formidable fighting force, the location of the land leaves her vulnerable to invasion from all sides (unwalled villages). Moreover, this “confidence” of Israel and the Jews will arise from a false sense of security stemming directly from the seven-year treaty orchestrated by Antichrist Nero between Jews and Muslims. This amazing treaty will be unopposed by virtually all nations on the earth that have been temporarily stunned by the disappearance of hundreds of millions from the earth and the chaos created by this staggering global event. Talk and a “paper” treaty will be cheaper than ever. Meaning that Antichrist Nero will pledge to come to the aid of Israel if she is attacked. Which, of course, he, and the ten-nation confederation that he is consolidating at the time, will not do when Russia, Iran, and Turkey liftoff their campaign against Israel. The extent of Nero’s (and his ten kingdoms) resistance to the Gog/Magog invasion of Israel will be lip service only. There will be no military challenge to Russia, Iran, Turkey, and other smaller nations in this Magog confederacy. (See Ezekiel 38:13). Let’s look at the third mention of peace in Israel that will be the incentive for Gog/Magog to attack her; also the reason that Israel will be caught off guard and unable to defend herself against such a massive coalition. Again, for emphasis, the Lord states: “Therefore, son of man, prophesy against Gog. Give him this message from the Sovereign Lord: ‘When my people are living in peace in their land, then you will rouse yourself. You will come from your homeland in the distant north with your vast cavalry and your mighty army, and you will attack my people Israel, covering their land like a cloud…’” (Ezekiel 38:14-16, italics for emphasis). This is not the extent of peace and confidence portrayed in Ezekiel. There’s only one thing that will bring Israel to a durable assurance that all is well; that they are stoutly secure in their beloved land. Obviously, it will be a phony peace and false sense of security, but the Jews won’t know that until it’s too late. It is nothing other than the astounding treaty initiated by Antichrist (Nero) that will “guarantee” this peace and security. It will be considered the greatest, most unlikely treaty of all time. Did you know that Nero’s main claim to fame during his 14-year reign as Caesar was a treaty he made between Rome and their arch-enemy (at the time) Parthia? That treaty endeared him to the common people as well as to the elite Senate and Roman legions. His post-Rapture treaty will also accomplish the impossible: reconciliation of differences between ancient enemies, Jew and Arab. There are two astonishing achievements that will immediately propel Nero into the international spotlight; with people from many nations, races, and languages yielding their allegiance and adoration. In order of significance, they are: His return from the grave (Abyss) and the Seven-Year treaty that he will orchestrate. But the reality of it: that treaty will guarantee war. First, the Gog/Magog assault against Israel; which will be dealt with directly by/from God himself. (See Eye of Prophecy article, God Fights for Israel, posted 7-30-16). Then the ten-nation confederation led by Antichrist in the last half of the Tribulation against many nations, but first and foremost Israel. This time, Israel must fight for its very survival. And this time, Messiah Jesus will return to the earth to rescue Israel (and the whole world) from annihilation. This final peace agreement will be orchestrated by Antichrist, and will be principally between Israel and Muslim nations. Out of envy, and also being unscrupulous, Russia’s Magog alliance with Iran and Turkey will seize the opportunity to invade Israel while also challenging the fledgling coalition begun by Antichrist Nero, who will need a couple of years to consolidate these ten nations (three of which will be forced to join Nero) into a powerful empire. That is another reason why the Antichrist will do nothing to interfere with the Gog/Magog invasion of Israel. Because of this treaty and because of the relatively peaceful relations with most of the Magog nations (excepting Iran), Israel will be taken totally by surprise. It’s a good thing that God will directly fight for Israel and completely destroy Gog; because Israel won’t stand a chance on her own. She will be caught too much off guard and there will be far too many of the enemy advancing (vast hordes). It will be like a scene in one of my favorite movies, Shane. 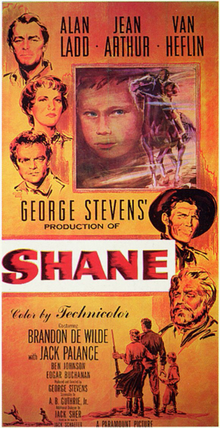 Just before Shane takes on the bad guys in the saloon, the boy played by Brandon deWilde pleads with Shane (Alan Ladd) not to fight. With the reason shouted by the boy: “But Shane, there are too many. There’s too many, Shane!” I often repeat this when watching any movie where the bad guys far outnumber the good guys! It’s a sure thing that the seven-year treaty shortly after the Rapture will lead directly to fulfillment of the Gog/Magog prophecy. But Scripture says nothing about the kind of peace existing in Israel as portrayed by Ezekiel before the seven-year treaty. Currently, there are too many adverse conditions to permit peace through a so-called two-state solution before the seven-year treaty. Two virtually insurmountable factors are: (1) the Arabs’ denial that Israel is a sovereign Jewish nation, which is why they have rejected direct negotiations with Israel; (2) Israel’s Biblically based refusal to allow Jerusalem to be a divided city, let alone the divided capital of both Israel and a Palestinian State (so-called East Jerusalem). If a Palestinian State does come into existence, it will most likely be one of the conditions of the seven-year treaty orchestrated by Antichrist Nero. (See Daniel 11:39 which speaks of the Antichrist “dividing the land” to those who submit to him). In next week’s article, we’ll examine some recent extraordinary turn of events, specifically involving Russia, Iran, Turkey, and Israel to demonstrate how close we are to the Gog/Magog invasion of Israel and, therefore, the astounding transfiguration of believers and our transportation to heaven … The Rapture! What God says will happen, always happens. I repeat for emphasis: ALWAYS. There are hundreds of Biblical prophecies that have come to pass to validate this truth. It’s just that they are happening with much more regularity in our generation. The birth pangs are increasing in frequency and severity. When all is said and done, the Bible is unambiguously clear that only one person can bring real lasting peace to the Middle East, to the entire world. None other than the Prince of Peace, Messiah Jesus (Isaiah 9:6). Until that time, all other treaties of peace will be both false and transient. Like past historical treaties that failed miserably and actually led to war, both parties to the settlement must have honor, integrity, and sincerity. There must be no ulterior motive, especially when the arbiter and/or one side to the treaty uses the pact to deceive and then destroy the other side. 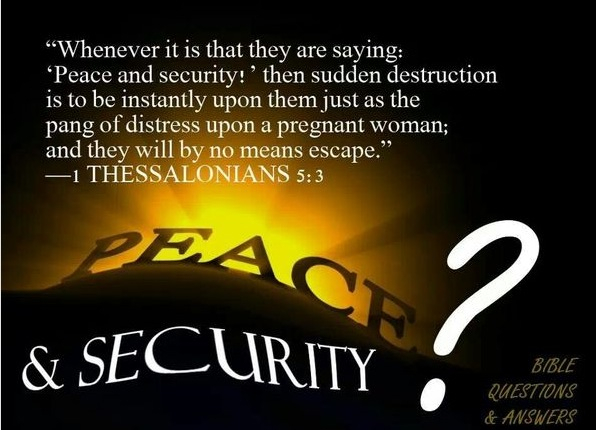 For all those who defy the God of Abraham, Isaac, and Jacob and reject their only hope for salvation and peace, through God’s Son, Yeshua, Scripture declares: “But there is no peace for the wicked, says the Lord” (Isaiah 48:22). For Israel and the Jews, God promised: “I will make a covenant of peace with my people…” (Ezekiel 34:25). Before that, Jeremiah announced this New Covenant would be radically different from the Old Covenant (Mosaic Law). Because, “…They broke that covenant, though I loved them as a husband loves his wife, says the Lord” (Jeremiah 31:32). No longer would it be a covenant written on stone tablets, commandments that God’s people wouldn’t and couldn’t keep because their hearts were as hard as the stones on which the commandments were written. “But this is the new covenant I will make with the people of Israel on that day, says the Lord. I will put my instruction deep within them, and I will write them on their hearts. I will be their God and they will be my people” (Jeremiah 31:33). 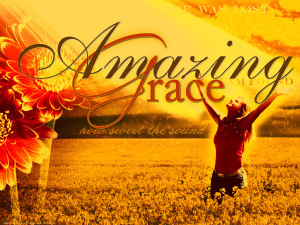 Says the Lord God to Ezekiel: “And I shall give them one heart, and put a new spirit within them. And I shall take the heart of stone out of their flesh and give them a heart of flesh…” (Ezekiel 11:19, NASB). As explained throughout Scripture: The difference between a heart of stone and a heart of flesh is the difference between a rote, hard-hearted, cold-blooded, compulsory adherence to religious rituals and creeds; versus a sincere seeking of God, with willing tender-loving heart-felt response of listening to and loving the truth about God and His Messiah (our Savior) that will lead to salvation and everlasting life. Individually for Jews (and Gentiles) that New Covenant of Grace began when Messiah Jesus arose from the dead after giving himself as a sacrifice for our sins and the penalty of those sins. To enter into that covenant, all we need do: “If you confess with your mouth that Jesus is Lord and believe in your heart that God raised him from the dead, you will be saved. For it is by believing in your heart that you are made right with God, and it is by confessing with your mouth that you are saved” (Romans 10:9-10). For the nation of Israel, corporately, this covenant of peace will be fully realized when Messiah Jesus returns to deliver Israel from Gog/Magog and then from the worst war of all time … Armageddon. For all peoples, peace on earth among men must first begin through peace with God. “Therefore, since we have been made right in God’s sight by faith, we have peace with God because of what Jesus Christ our Lord has done for us” (Romans 5:1).